Most playgrounds have a metal dome climber, because they are inexpensive to build and are great for children. They are able to support multiple children due to their design. As many as ten kids if not more can play on one at any given time! 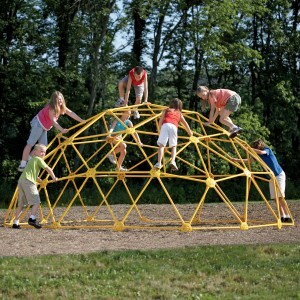 Children will rarely get tired of a metal dome climber, because there are so many games to play while on it. If they're not in the mood for games they'll still be able to relax on it. Children will build muscle and coordination without even realizing that they're exercising. Playing on a playground is a much better alternative than sitting at home and playing videos or watching television. Obesity is becoming a worldwide problem; experts have even predicted that by 2030 more than half of Americans will be obese! By giving children a fun way to stay active and healthy, they'll live longer and feel better about themselves. However it is important to consider a few things before buying a metal dome climber or any other equipment for that matter. Safety is number one among those. Always make sure that the equipment is made of sturdy and reliable material.